Bollywood CineTalk: Why Didn't Jai Ho Take Record Breaking Opening? Why Didn't Jai Ho Take Record Breaking Opening? Salman Khan is one of the biggest superstar in Hindi Cinema ever and therefor, everyone is shocked with the opening Jai Ho got. It has taken decent start at box office but for being a Salman Khan starrer, Jai Ho was supposed to take atleast bumper opening. After Dhoom 3′s record-breaking opening in December, most in the trade were expecting a 25 crore+ opening as the film released on a record number of screens in India. However, it collected 17.25 crore on Friday on a total capacity of more than 40 crore. When every Salman Khan film since Dabangg (2010) has opened well, why hasn’t Jai Ho – with good reviews and reports – taken a flying start? Below are a few reasons why we think the film disappointed on day 1. Bad Release Date: Januray has never been a good month for releasing a big movie. Salman Khan & Shahrukh Khan had a big blockbuster in January 'Karan Arjun' way back in 1995, Salman Khan had one super hit 'Sanam Bewafa' in 1991 and Aamir Khan had one hit 'Rang De Basanti'. All other releases of Khan trio in January were either flops or disasters. And after 2010, opening of any movie matters a lot as more than 50% collections come from first week itself. Therefor all superstars want to release their films on big holidays like Eid, Diwali, Christmas etc. Without being any festive season, January was never a good choice to release a big film like Jai Ho. Unexciting Promos: There is a saying in the industry that the audience decides whether to watch a film or not, depending on how they like the first trailer. Jai Ho was expected to be different from other Salman films, but the trailer gave the audience an impression that it is a typical run-of-the-mill action-masala film. Also there were way too many mass-pleasing action scenes, due to which the family audience probably decided to give the film a skip. After watching the film, we felt that there were many other & better scenes which could be used in promos. Absence of Chartbuster Music: Let's have a look at the music of some last Salman Khan movies. Dabangg had Munni Badnam Hui, Chori Kiya Re Jiya and Hud Hud Dabangg. Ready had Dhinka Chinka and Character Dheela Hai. Bodyguard had title track, Teri Meri and I Love You. Ek Tha Tiger had MashAllah, Saiyaara and Lapata. 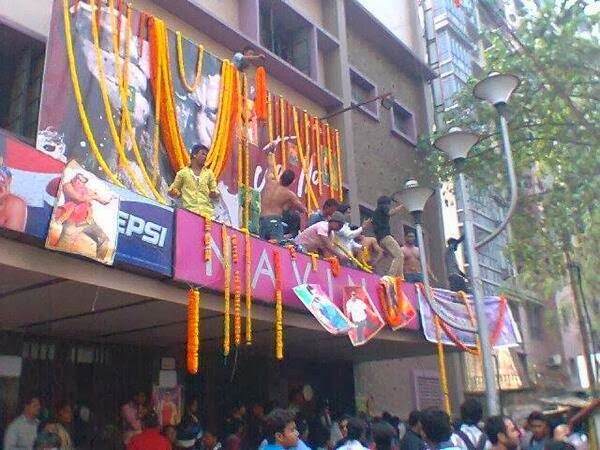 Dabangg 2 had Fevicol Se. Jai Ho has none. Music of Jai Ho in itself is not bad, but Sajid Wajid went terribly wrong this time. Amal Mallick's compositions were too 'youthish'. In short, music of Jai Ho couldn't create the hype and buzz it was supposed to do. Extreme Cold in North India: Weather in North India is extremely cold nowadays with much fog. It could have an negative impact on the opening of the film. As promos failed to excite people, they were not so excited to go for a film in this extreme cold weather. DVD Rip Pirated: Yes, DVD Src Rip was available at Friday night and early Saturday, DVD rip with great audio quality was also available on internet. While downloading movie on internet is not a popular choice for masses but for urban audience it is. Jai Ho downloads are much higher than other films. When checked recently, there were active 14000 downloaders last one hour for Jai Ho. There were 25000 downloaders for Dhoom 3 in 5 hours. Serious Social Message: Though the movie has funny moments, a romantic track and full on action, but it has a serious social message also. A lot of people who like to have fun and watch films to forget every problem, might have stayed away from the film because of this social message. Excess Of Action Masala Films: Just before the release of Akshay Kumar’s Boss, Salman had said “This space (masala films) will die totally. I think this was a beautiful format when we had films like Wanted, Dabangg etc. Now everybody has overdone it so much that it might die away. These kinds of films are popular but the creativity is becoming less… It seems the same stuff is happening. I don’t know which genre will click now”. Mediocre Production Values: Production values of Jai Ho are not like Dhoom 3 or Ek Tha Tiger. Multiplex tickets cost a bomb. Unless a film has high-production values and has that big-film feel, the audience will think twice before spending Rs 2,000 for a movie outing with family. The release of Dhoom 3 a month before Jai Ho could also have had an impact on business. Leading lady: Both the media and the audience have been way too harsh on Daisy Shah. People were not so curious about her before the release of the film. Lack of Promotions: Jai Ho Team started promoting film very late. Now, when stars like Shahrukh Khan start promotion (creating buzz and hype) for their films 6-7 months before the release, makers of Jai Ho were very late. They had a very powerful promotion compaign in last one month, but still they could not reach to maximum people. Overexposure of Salman Khan: When the superstar is over-exposed on television and provides enough and more entertainment with his antics on the small screen, the audience need a little more incentive to pay those hard-earned bucks on his movies. We feel that in different territories of India, all or some of above reasons have played a role against the opening of Jai Ho. Salman Khan's next Kick is supposed to release with 100% occupancy on EID since it's an event film and we hope makers of Kick will learn from the mistakes of Jai Ho makers.